Sister Alice just plain enjoys people; “doing things with them, listening to them and drowning them out with what I have to say,” she says with a laugh. That personality trait, evidenced by her warmth, graciousness and hospitality, have made many sisters’ initial formation experiences memorable. In 2004 she was honored for her lifelong commitment to formation ministry by the National Religious Formation Conference at its 50th Jubilee. Born at St. Elizabeth Hospital during the Depression, Alice was educated by the Sisters of Providence at St. Joseph Academy in Yakima, as were her mother and grandmother. That meant being driven on Sunday nights to their grandparents’ home, where they could walk two miles to school and back. On Friday nights, their dad would drive them home to the farm for the weekend. That was a special time because of Alice’s love of family, relaxing walks and the beauty of the outdoors. After graduation, she stayed on the farm for a year and a half to help her mother care for her youngest brother Paul, and then entered the religious community in Seattle in November 1947. Lucy St. Hilaire, who was a year younger, entered six months later. Sister Alice made first vows in 1949 and taught primary grades and music in Missoula, Montana; Walla Walla, Washington; Fairbanks, Alaska, and Seattle. Later she taught philosophy at the College of Sister Formation of Seattle University at Providence Heights and on the university’s downtown campus. 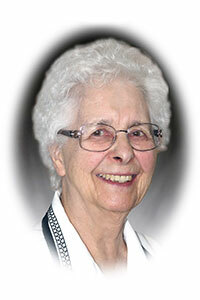 She was chosen for the first Formation Team, served on the Provincial Council and at Providence Hospitality House. In 1990 she returned to the Yakima Valley to care for her mother until her death two years later. Sister Alice suffered another loss with the death of her sibling, Sister Lucy, in 2013. Sister Alice just plain enjoys people; “doing things with them, listening to them and drowning them out with what I have to say,” she says with a laugh.